While technology has many benefits, when it comes to screen time for children, too much screen time can lead to harmful effects including obesity, sleep and behavioral issues, and educational challenges. It can also adversely affect brain development, as children spend less time playing or engaging in physical activity. This especially affects children with ADHD or other learning differences. Getting away from screens often improves focus, behavior and academic ability and gives your child more time to burn energy outside, get to know new friends, and enjoy more creative or academic activities. 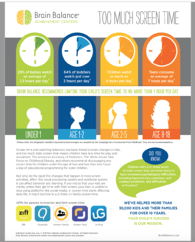 At Brain Balance, we recommend limiting your child’s screen time to no more than one hour per day.